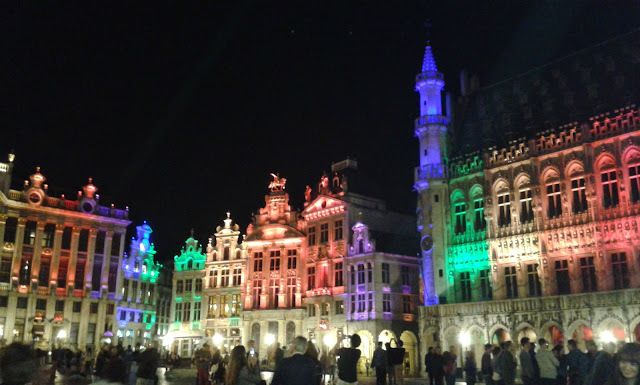 Taking a trip to Brussels is like taking a trip back in time. 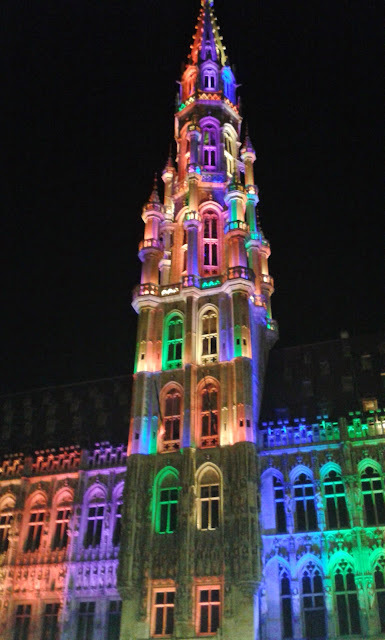 Belgium was my first ever real holiday abroad with faithful travelling companion (apart from a mini-cruise to Amsterdam) and in our early days Belgium was the default holiday destination, and this would always involve a day trip to Brussels. But is there more to Brussels than a day trip? We decided that this question would finally be answered when we chose Brussels for this year's spring break destination, once we discovered that there were direct flights from Edinburgh to Brussels Airport. 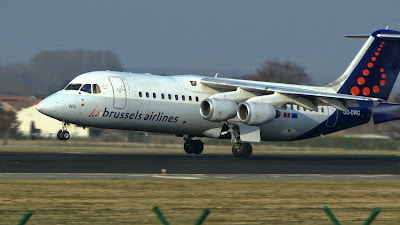 So we headed off on Tuesday 12th May on the very small but perfectly formed Brussels Airlines plane. It's a short and very pleasant flight lasting approximately only an hour and a half. Just like many other airports in Europe, it's an integrated travelling experience. Your flight lands, passport control is quick and painless, and you make your way to the airport's own train station which is in the basement of the airport. Although Belgium is a very small country it has an incredibly well-connected train system, After another quick and painless experience of buying train tickets, it's an effortless connection between the airport and Brussels Central station, just a 15-20 minute train ride away. The scariest thing about this is the steep climb from the platform on to the train - you really do need to mind the gap! Usually the 'travelling day' can be very stressful but our taxi/train/bus/plane/train combination was surprisingly smooth. And there was one final transport element: walking. Happily though, it was only a few minutes' walk from the station to our hotel, which as locations go has to be one of the best and most central we have ever had: just minutes away from the Grand Place/Grote Markt which is one of Brussels' most famous and scenic sights, and I have that all-important 2015 must-have - a reliable wi-fi connection to catch up with the Eurovision rehearsals going on this week. After what's felt like weeks of torrential rain, high winds and generally horrible weather, it's a joy to arrive in a city pleasantly baked in sunshine, without feeling too hot. So with all the check-in formalities out of the way, let's put the telly on, shall we? So we're doing our unpacking to Anne-Marie David, The Herreys etc before heading out into the city for out evening meal. 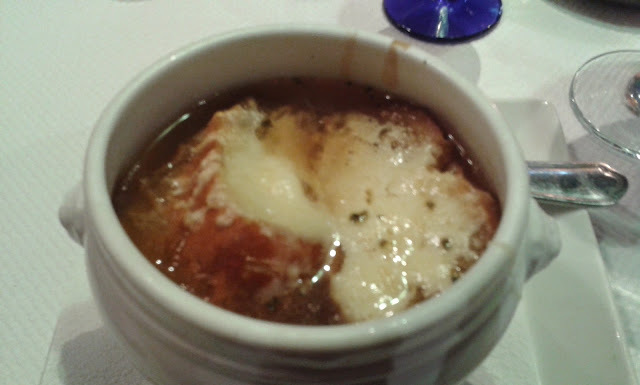 There is so much choice around but we take the easy option and head for that legendary Brussels culinary tourist trap: the Rue des Bouchers. After what turns out to be a very nice meal there is another must-do thing - check out the Grand Place at night. We didn't expect the grand by name, grand by nature buildings to be so spectacularly illuminated at night. But they are. And aren't they stunning? 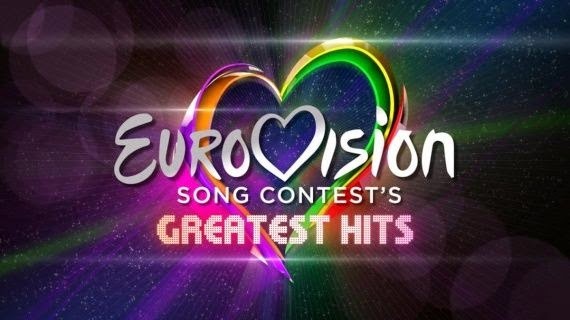 So Brussels has already brought the "wow factor". The next thing we need to do tonight? Well, we are in Belgium. Beer is inevitable. For the uninitiated, Belgium is very famous for its many, many beers. 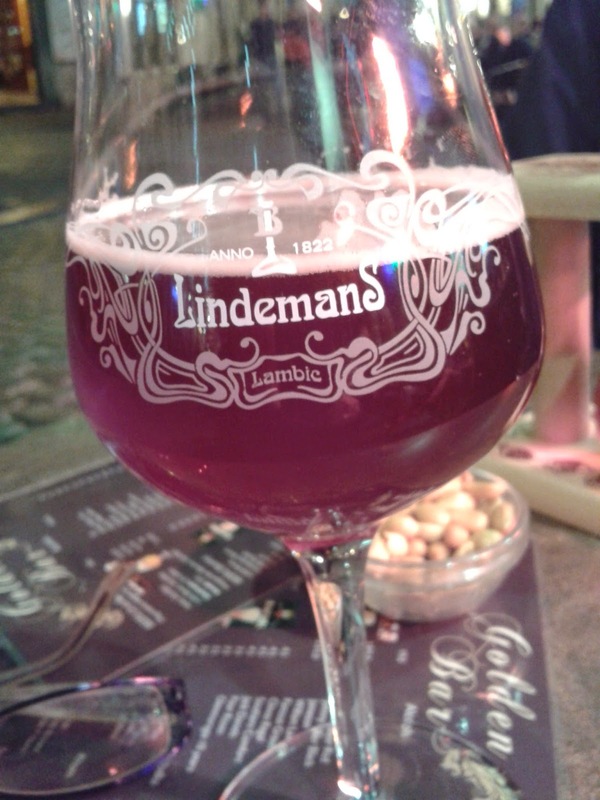 Now I am not generally a beer drinker but love the Belgian fruit beers - Kriek (cherry), Framboise (raspberry) and Cassis (blackcurrant) so there was no prizes for guessing that my first beer in Brussels would be a Kriek (pictured above). Of course every bar menu has tons of beers to choose from, all with their own individual matching glass, - I love that! - and many of these vary in alcohol strength so if you want to try out beers in Belgium, please drink responsibly of course! It was extremely interesting to see the contrast between our own country's drinking culture, where drinking to get drunk seems to be a national sport, whereas over in Brussels, despite all that choice of beer, there was very little evidence of drunkenness as far as we could see. It's been a long day but it's no early night for us though as we are enjoying the late night Brussels life, You wouldn't expect a Tuesday night to be busy but the city is buzzing and there's a good atmosphere. A very nice way to end the evening! In the next instalment: sightseeing and shopping. And more beer.